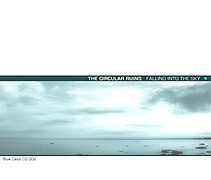 The Circular Ruins (Anthony Paul Kerby) is exploring a personal realm of assertive, emotional ambient music. A fascinating series of electronic poems that invent a sonic sphere all their own, Falling Into the Sky (64'11") attempts to liberate the mind of the listener from its own self-impression. As soundscapes gradually shift and unfold, textures transform and we linger easily within a wondrous soundworld. Synthesizer pads churn behind fluttering atmospherics while further in a digital wind stirs up strange cosmic debris. Narrative runs adrift and the hiss and murmur of distant chords occupy the foreground. Vibrating with energy, Falling Into the Sky inhabits the amorphous area between the earth's surface and outer space, and continually reveals itself in revelations revealed in repeat visits.